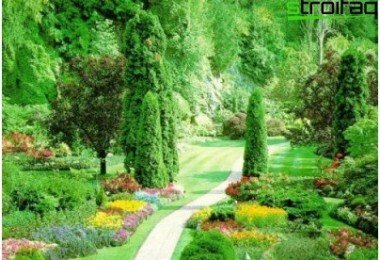 If you have a garden, you - lucky, because livein the embrace of nature is interesting, pleasant and informative. Take care of the green "settlers", to admire the awakening of vegetation after winter "hibernation", enjoy flowering, collect a bountiful harvest, tinkering garden figures with their hands, and just - relax in the shade under the rustling of the leaves and birds singing - all this makes one closer to nature, happier, healthier. Want to check it out? 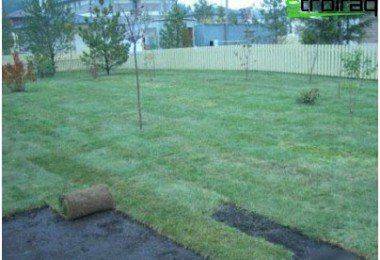 Buy a piece of land with garden and try to "make friends" with him. Fairy store offers goods forgarden ornaments complicates the choice, as the eyes diverge from the great number of original sculptures and shapes. So hard to choose just one thing, because like a lot, because such products is a novelty for us. 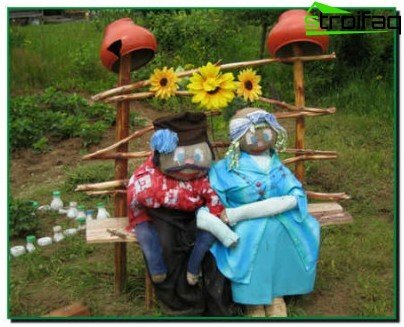 You have decided to do garden figures to testify on their own, guided by master classes on the web? 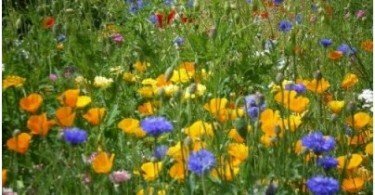 But here you will find a kaleidoscope of options, because modern landowners - the creative personality, fondness for sharing their achievements. So how do you correctly choose the style and forms for garden figures? It is reasonable to want to invest money and time to transform the ownership for the better. 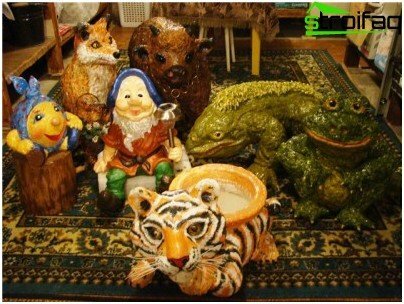 You can arrange the garden village "performance"
So, you will buy or manufacture of garden figures. What principles in the selection of such jewelry is recommended to adhere to highly experienced landscape designers? Compliance with the overall style. Unfortunately, not all-new gardeners take into account this circumstance. Many simply buy or make jewelry according to their own tastes and imagination. Of course, it is commendable, but your masterpieces, despite their beauty, may not "fit" in style, and as a result the overall disfigure natural "picture." Imagine you are a Japanese garden decorate the statue of Venus, koloboks and palm trees. What will it be? 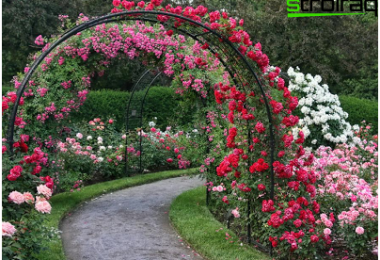 Rather, "the room of laughter", rather than a harmonious garden, is not it ?! Choose forms and images in unison with the main design focus. For example, a wonderfully romantic garden decorate garden figures made of plaster as cupids, doves and flowers. 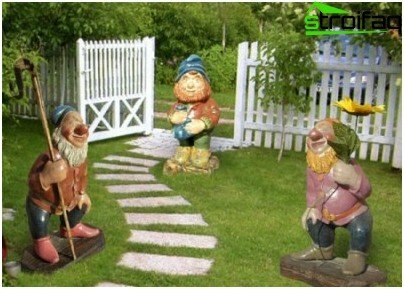 Country style will brighten German garden figures of polyresin as dwarfs. 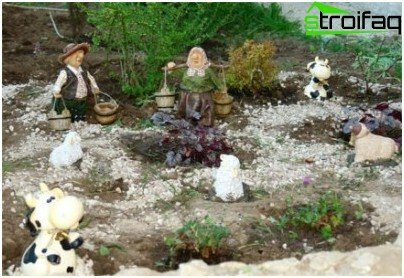 The village landscape is excellent "fit" garden figures made of wood. Style high-tech accentuate the characteristic garden figures made of metal. Moderation. Some land owners, fascinated by the idea, turn the territory into a museum. 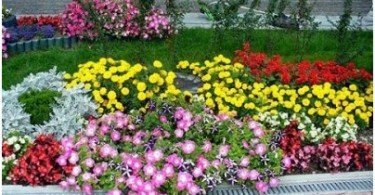 Do not forget that you are decorating nature, and are not satisfied with "Showroom". "Contact" to size. If the trees are huge and mature, you will agree, tiny figures simply get lost among such "giants" as well as, on the contrary, the massive statue would look out of place in a young garden. The correct composition. 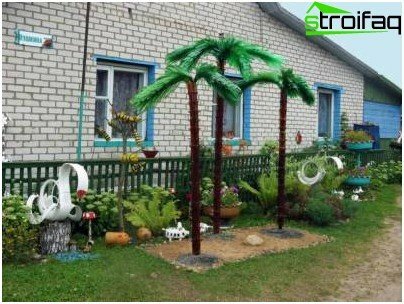 Sometimes the "neighbors" are unsuitable to each other on the subject, form and color decoration. Stick to one "line". Sketch plan of placing figures. "Fitting" You can even arrange. To do this, cut the contours of future creations and place them in places where you expect to "settle" new "residents". Such a "rehearsal" will help you make the right choice of shapes, sizes, colors and themes. 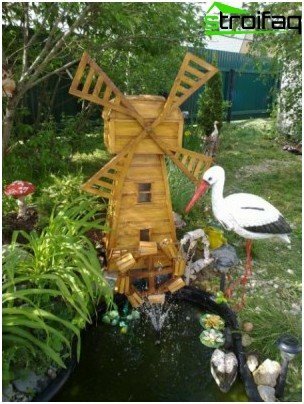 If the transformation of the territory of the meager budget orland you in a temporary use and it makes no sense to invest, the best solution - make garden figures from plastic bottles, the benefit of this free "raw materials" is now in excess. 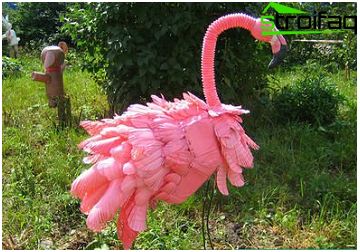 Consider how to make plastic bottles of bubbly a bird flamingo, which will be an excellent decoration of the territory in almost any garden. Step 1 - the body. Take one of the great vessels, the lid to make a hole, insert into the hole and secure the metal rod - is the future neck. At the other end also make holes - for the feet. Step 2 - tail. The rest of the bottle should be covered with pink paint. Why not at the end? You can not so well to paint every feather, so it is recommended to do the plumage of a ready material. Just slice the feathers in the "body" makes an incision and attach every detail. Step 3 - head and neck. On the rod put on the hose. Head carved out of the bottle. 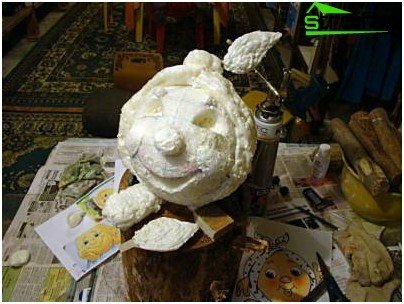 Beak and other components of a head fashioned from wood or plastic, you can put to use plaster or cement to give details of the desired shape. Step 4 - legs. The remaining rods - it's legs. Insert them into the holes previously Realized and carefully tighten. Step 5 - "tuning". Paint and decorate your creation as fancy dictates. It is worth paying attention! Note that the average height of a flamingo - 1.5 meters. Do not make a huge figure, it's not a dinosaur. 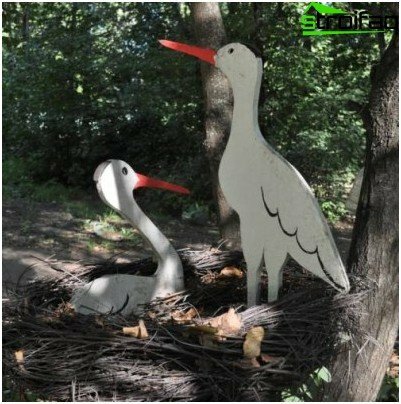 Lovers decorate land with his own handsThey argue that garden figures of foam - the first step in the transition from amateur experiments with plastic raw materials to the level of the skills in the field of garden design. Let's start with a simple example. How to use foam to make the colorful Bun? 1. The ball should be covered with foam. The number of layers - at your discretion. The main thing - every one of them dry thoroughly. 2. On each side of thread the wire bend, cupping hands. Attach pieces of hose, and cover all foam. 3. On his head to make a "scarf" of the foam. For the "laces" or "bow" should take the form of cardboard. 4. Using a knife, trim shape Bun, cut mouth and eye sockets. 5. For the legs you need to attach the bars cardboard (foot) and also cover the foam structure. 6. As an eye, you can use an old tennis balls that need to be painted in black. 7. The final touch - the paint. 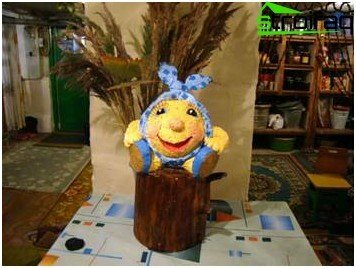 Sam bun traditionally desirable to cover the yellow paint, to make red mouth and blush. Scarf and shoes razrisuy in other rich colors. Fairy bun ready! 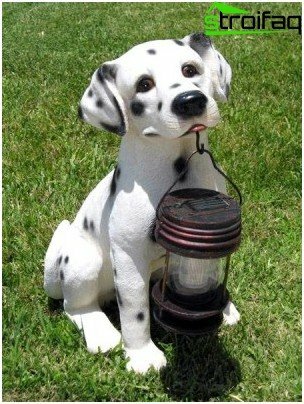 It remains to hoist it on a stump and "settle" in the garden. 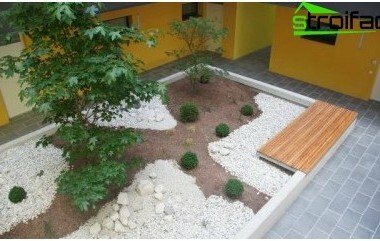 Lovers of ecological garden "decorations"should take the "adopted" the simplest and most accessible material - wood. 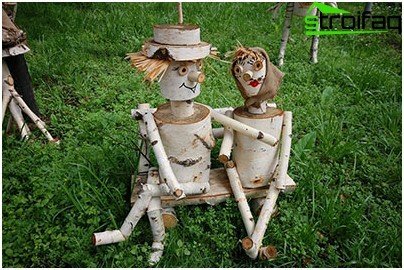 Such raw materials are as logs and stumps and branches, driftwood and other natural uselessness found on your site or in the woods. From the chocks can make anything you want, fromamusing men and ending with fantastic heroes. 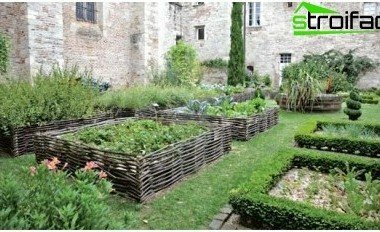 It is enough to take a couple of pieces of wood, hold them, to show imagination, paint a bright hues, and your garden "will come to life." 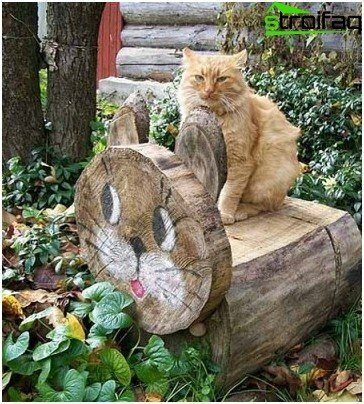 You can make a home "zoo" or enliven a scene from a favorite cartoon. The tree - in a sense, "clay" from which you can "sculpt" anything you want. The main thing - to stock up on a set of tools, paints and unleash the imagination. 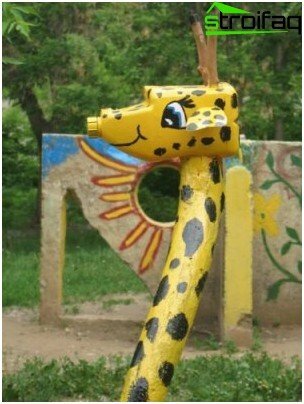 Consider a simple example of the manufacture of a giraffeunnecessary snags. Your crumbs will be insanely happy about this "guest." By the way, get this creative project to all the family, to see how it's fun, and spend time in the air to good use. 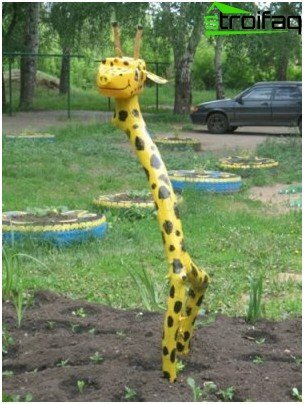 Experienced gardeners recommend for stabilityGiraffe make a "foundation." To do this, dig a hole and cemented in her future "legs" of the animal. The head can make out unnecessary cans. If the container with a handle, it should be cut. 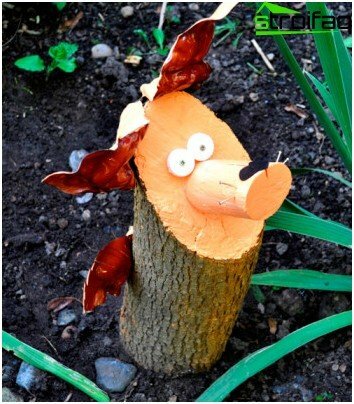 At the top, make two holes and insert sticks or pieces of thick branches - it's ears. At the bottom of the canister hole needs to be done in order to put his head on the trunk. Then cover with oil paint masterpiece. Draw eyes and all that you want. 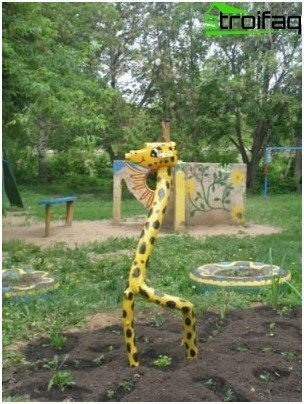 Wonder giraffe ready - to the delight of your toddler. You can tie around the neck of the animal bright scarf, which will flutter in the wind, entertains everyone who sees fashion wooden "beast." Master of his own hands the figures for garden decoration fun and entertaining. Join now!